If you’re sick of living paycheck to paycheck, being stressed about money, and being scared to look at your bank account then you’ve come to the right place. If you're drowning in debt and can't seem to get ahead no matter what you try, you’ve come to the right place. I struggled with money for years. I spent more than I made, couldn't wrap my mind around how to make a budget actually work for me and I was struggling with just everyday life. I would “get organized” and have amazing results for a few days and then go right back into my old habits and dig myself deeper in the hole. I had a job that made me work crazy hours with frequent shift extensions and schedule changes. 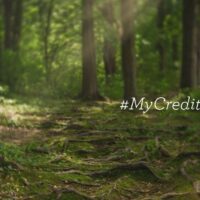 I wanted to stay home with our kids so bad and knew that there was no way that could happen unless we paid off our debt. Everything I tried, I failed at. In the FREE 90 Day Budget Bootcamp, I finally realized that money, organization and routines go hand in hand. I couldn’t just dedicate myself to spending less. I had to master the basic skills I needed to support my efforts to spend less. And from that instant, everything changed. You want to spend less on groceries, right? So you meal plan and buy all of the groceries for the week. Day 1 and 2 start off great but then you work late, and your toddler gets sick and you don't get a chance to do the dishes. Life gets in the way and the next thing you know, you have a week's worth of groceries rotting in the fridge and you're back in line at the drive thru for dinner. 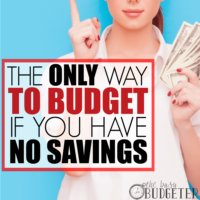 You don't just need to know how to budget. Don't get me wrong, budgeting is important. 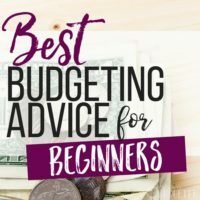 But you also need to know how to master the basic skills that will support your ability to follow a budget. You need an easy routine to get the dishes done every day. A routine to prep simple food ahead of time. A meal plan that takes into account your insanely busy schedule. A budget that you can actually follow and that tells you what to do when you break it. (Because you will). If you don’t master the foundational skills first, then you’ll end up right back at the drive thru. As soon as I made that connection… I started seeing real change. And what happened next is incredible. I had a total life transformation. I figured out how to create a budget. 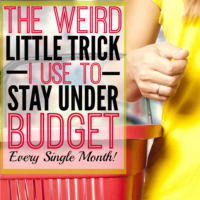 I figured how to live within that budget and how to handle it when I went over budget. I figured out the simple basic routines that support my efforts to save money. I learned what to let go, what I don’t need to focus my attention on so that I can make more time to focus on the financial goals we have. I learned how to meal plan, prep foods ahead of time and make basic substitutions that save money without sacrifice. I learned how to get my spender husband on board with saving money. I learned how to make him excited about working together with me on this. And those changes, while small and sustainable by themselves, led to us paying off over 30,000 worth of debt, it allowed me to quit my job, and then make up my salary from home running a home day care. I started a mission to help others that feel hopeless with budgeting. Your situation is NOT hopeless. I don't care how bad it may seem to you. Your story is not done. This is the messy middle. The messy middle is a normal part of literally everything in your life from relationships, jobs, goals, and even businesses. Ever read a book where everything worked out wonderfully by page 100? I know enough to know that if you burn the book in the middle of the story, you'll never have a happy ending. I started this mission to give people the step by step guidance that they need to get on the right path. In the order that you need it. Step by step. And the best part? It won't cost you a dime. 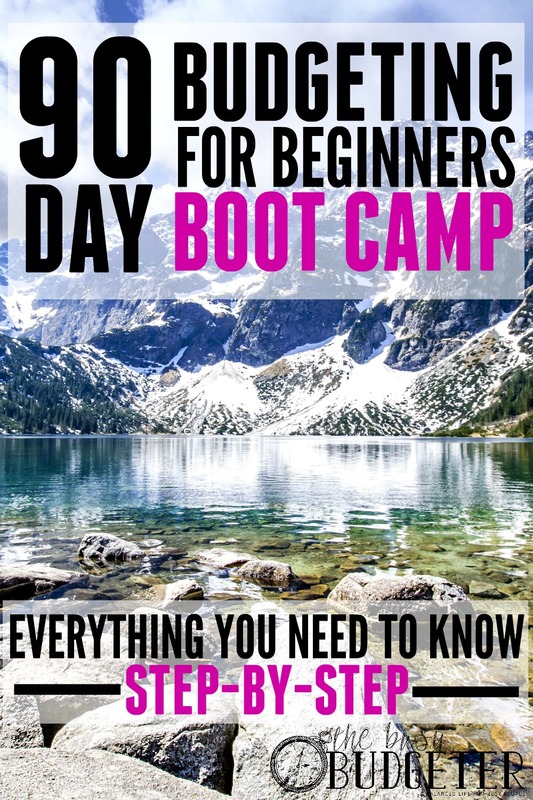 You can sign up for the 90 Day Budget Boot Camp for FREE by clicking here. Hello, I am really enjoying the challenges and appreciate your time and effort. I am going through your emails for this challenge and realized that I am missing some. I have 1-4 but not 5,6 and 9. And I checked my spam folder but it’s not there either. Is there anywhere on your blog that I could get those? I do have challenge 10 and 11 but can’t get past number 4 because I want to do them in order. Thank you for any help you can offer and thanks again for sharing all this helpful information!! Can you email me at busybudgeter@gmail.com and we’ll send then right out? Hello! I seemed to not have challenge 3. I checked my emails and I have 1-2 and 4-14 but no 3. Is there anyway I can get that? Let me know. Thanks! How does this work, do you get new challenges everyday or what? You’ll get weekly challenges (I’ll keep you busy but not overwhelmed), for the 90 days. We’ve had some incredible results from past students and it’s 100% completely free. Is there a way to make it a book like the one you have shown all bound together. I am definitely a workshop/challenge perfectionist lol and like to have everything ready to go. I get so much in my email these days, I miss challenges. I like having printouts since I can do them on break, while waiting for kids, and can write everything in one place. I just completed challenge one and it was very enjoyable – but the problem is, I want to sit down and do as much as possible in the free time that I have! Is there a way to get all the challenges in one go? Can you get a book that is bound together as shown? I ordered and paid for the workbook. I didn’t print it and went to print it today and can not find it. Please help! I have my receipt. Does the first challenge include utilities and rent? I requested the free workbook but received the “Ultimate Money Saving Checklist.” How can I get the workbook sent to me? I’m sorry. I was not clear. I paid for the work book but nothing is there to print. Can you resend to me? I paid $7 for the 90 day budget bootcamp and have misplaced the email. I have the receipt. Can you please contact me ASAP as I am anxious about starting this process. I subscribed and printed the Checklist. I confirmed my subscription, but i don’t see anywhere where I can download and print anything else… Everyone is saying they paid $7 for a workbook, but i don’t see a link for that either. Am i missing something? This sounds like a great boot camp. It’s always helpful to have a budget. What is exactly is everyone getting for $7. Is it something different from the challenges I just downloaded? Hi! I keep seeing things about paying to download a workbook and I’m interested!! Where do I find that? I am finally getting to do these challenges and going to my emails I can m can’t find challenge 1 or 3 van you help? Where can I buy the $7 book? Thank you!